Much of my current enthusiasm about cooking eggs stems from a simple fact, if I eat an egg (or two) for breakfast I'm satisfied until lunch. The same can't be said about bagels. I mention bagels because they are one of the few non-pastry items available at most cafes in the morning. All the cafes in my neighborhood serve whole wheat bagels, which being completely honest here, I tolerate more than I enjoy. Some of you might cite the breakfast bagel as a viable and satisfying breakfast choice and you aren't alone, one of the local spots does a brisk business in these egg-and-cheese topped creations. But I'm going to argue that the bread (bagel) to egg ratio is a bit out of balance for my tastes - they should serve these open-faced with no top. No? So, this got me thinking about a better breakfast. A better egg breakfast to be specific. Omelettes, boiled eggs, fried eggs, and scrambles are all old hat for me - I wanted to explore territory I wasn't as comfortable with. What about baked eggs? Bingo. What about baked eggs in edible cups? Even better. I knew I wanted these to be individual egg cups (maybe tart is a better word? ), so I suspected standard muffin tins would work well as molds. I would tuck some pita, or thin lavash bread, or a tortilla, or two very thin, long criss-crossed slices of potatoes into alternating muffin slots. Add a bit of filling, crack an egg on top of each cup, and bake. I needed to work out the filling and decide what other ingredients I wanted to pair with the eggs - what other flavors I wanted to introduce. I love Spanish tortillas (with eggs and potatoes) served with romesco sauce, so I thought that might serve as inspiration. Unfortunately it was also going to require a special trip to the store. Instead, I raided my spice drawer for smoked paprika, chile flakes, and cumin. 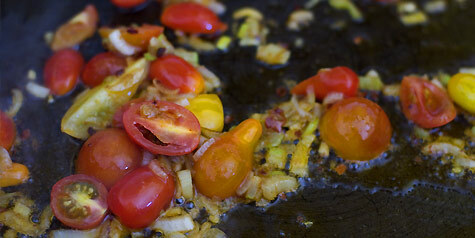 Hit up the refrigerator for a couple handfuls of tiny cherry tomatoes, and chopped up a spring onion. The idea was: make filling, crack egg, bake, and serve on pretty plate with simply dressed salad on the side. the cool thing I'm not realizing is that you could do your little sauteed filling the night before, and have six of these in the oven the next morning in under two minutes for a brunch or even breakfast before work (bake while blow drying). So here is is the my baked egg recipe plus a couple other variations I'd like to try in the future. Let me know your ideas as well! Or what about a maple-kissed version with something savory to bridge and temper the sweetness? Eggs cooked crepe thin and stuffed. A delicious and lighter alternative to heavy, cheese-stuffed omelette recipes - great for lunch and brunch.